New Feature: The Old Switcharoo! Do you manage multiple brands on Empire Avenue? Tired of logging out, remembering passwords, not to mention the incessant amount of typing? Suffer no longer! Empire Avenue has implemented a new system to help you manage all of your accounts called Quick Login! "Well that all sounds great, but how does it work? To start simply navigate to your Account Settings by clicking on the gear icon at the top right of the screen. From here you should see an option titled "Manage Quick Login". 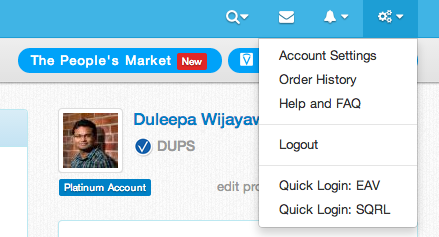 From here you can add Usernames that you wish to log into from the account that you are currently logged in as. Adding a Username will send a request to the to the added Username which must be accepted before the Username in question is added to your Quick Login page. Once added, as shown above, you can access each account with the Settings menu. The ability to add accounts to Quick Login can only be accessed with a Silver Premium account or higher, this does not mean however that any accounts added to Quick Login need to be Premium Accounts. Any account can be managed, but only Silver Premium Accounts and higher may do the managing. We hope that this new feature will help with account management. Are there any other functions you would like to see added? Feel free to leave us a comment in the Empire Avenue General Discussion Community!